In recent years, the Russian government has enacted a series of laws designed to target members of its LGBT (lesbian-gay-bisexual-transgender) community. These include forcing LGBT organizations to register as “foreign agents,” banning depictions of homosexuality (including carrying rainbow flags) in front of young people, and denying permission to LGBT groups wanting to organize gay pride parades. Unfortunately, homophobic attitudes and even violence are not uncommon in Russian society. For example, groups such as Occupy Gerontilyaj have been known to lure and then beat and torture gay teenagers. In 2012, a video that surfaced online showed six members of another far-right-wing organization torturing a young man who later died, according to the Spectrum Human Rights Alliance (a group that advocated for LGBT rights in Eastern Europe). In recent years, several commentators have drawn parallels between Russia’s persecution of its LGBT community and the treatment of the Jewish community by the Nazi regime in the years leading up to the Holocaust. Contemporary increases in globalization and immigration are leading to more culturally diverse populations in many countries. These changes will create many benefits for society and for the individuals within it. Gender, cultural, sexual orientation, and ethnic diversity can improve creativity and group performance, facilitate new ways of looking at problems, and allow multiple viewpoints on decisions (Cunningham, 2011; Mannix & Neale, 2005; van Knippenberg & Schippers, 2007). On the other hand, as we have seen in many places in this book, perceived similarity is an extremely important determinant of liking. Members of culturally diverse groups may be less attracted to each other than are members of more homogeneous groups, may have more difficulty communicating with each other, and in some cases may actively dislike and even engage in aggressive behavior toward each other. 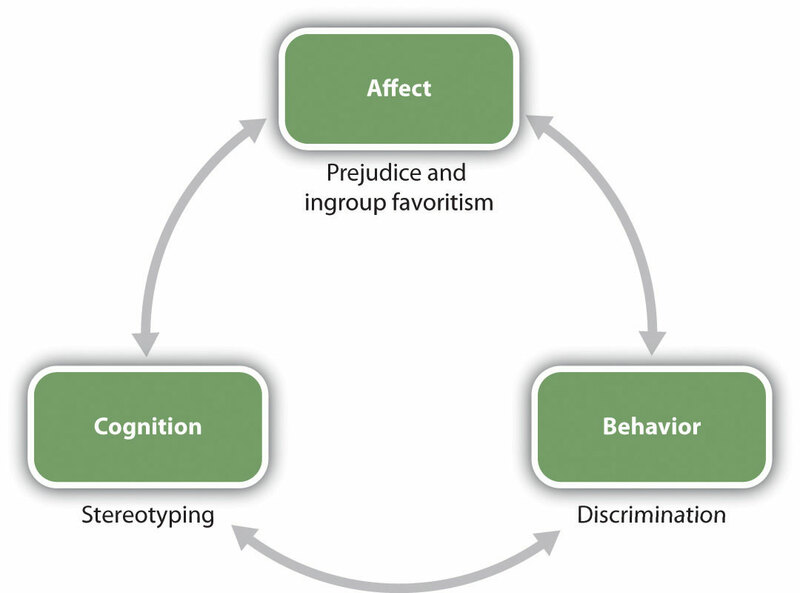 The principles of social psychology, including the ABCs—affect, behavior, and cognition—apply to the study of stereotyping, prejudice, and discrimination, and social psychologists have expended substantial research efforts studying these concepts (Figure 11.2). The cognitive component in our perceptions of group members is the stereotype—the positive or negative beliefs that we hold about the characteristics of social group. We may decide that “French people are romantic,” that “old people are incompetent,” or that “college professors are absent minded.” And we may use those beliefs to guide our actions toward people from those groups. In addition to our stereotypes, we may also develop prejudice—an unjustifiable negative attitude toward an outgroup or toward the members of that outgroup. Prejudice can take the form of disliking, anger, fear, disgust, discomfort, and even hatred—the kind of affective states that can lead to behavior such as the gay bashing you just read about. Our stereotypes and our prejudices are problematic because they may create discrimination—unjustified negative behaviors toward members of outgroups based on their group membership. Although violence against members of outgroups is fortunately rare, stereotypes, prejudice, and discrimination nevertheless influence people’s lives in a variety of ways. Stereotypes influence our academic performance (Shapiro & Neuberg, 2007), the careers that we chose to follow (Zhang, Schmader, & Forbes, 2009), our experiences at work (Fiske & Lee, 2008), and the amount that we are paid for the work that we do (Jackson, 2011; Wood & Eagly, 2010). Figure 11.2 Relationships among social groups are influenced by the ABCs of social psychology. Stereotypes and prejudice have a pervasive and often pernicious influence on our responses to others, and also in some cases on our own behaviors. To take one example, social psychological research has found that our stereotypes may in some cases lead to stereotype threat—performance decrements that are caused by the knowledge of cultural stereotypes. Spencer, Steele, and Quinn (1999) found that when women were reminded of the (untrue) stereotype that “women are poor at math,” they performed more poorly on math tests than when they were not reminded of the stereotype, and other research has found stereotype threat in many other domains as well. We’ll consider the role of stereotype threat in more detail later in this chapter. In one particularly disturbing line of research about the influence of prejudice on behaviors, Joshua Correll and his colleagues had White participants participate in an experiment in which they viewed photographs of White and Black people on a computer screen. Across the experiment, the photographs showed the people holding either a gun or something harmless such as a cell phone. The participants were asked to decide as quickly as possible to press a button to “shoot” if the target held a weapon but to “not shoot” if the person did not hold a weapon. Overall, the White participants tended to shoot more often when the person holding the object was Black than when the person holding the object was White, and this occurred even when there was no weapon present (Correll, Park, Judd, & Wittenbrink, 2007; Correll et al., 2007). Discrimination is a major societal problem because it is so pervasive, takes so many forms, and has such negative effects on so many people. Even people who are paid to be unbiased may discriminate. Price and Wolfers (2007) found that White players in National Basketball Association games received fewer fouls when more of the referees present in the game were White, and Black players received fewer fouls when more of the referees present in the game where Black. The implication is—whether they know it or not—the referees were discriminating on the basis of race. You may have had some experiences where you found yourself responding to another person on the basis of a stereotype or a prejudice, and perhaps the fact that you did surprised you. Perhaps you then tried to get past these beliefs and to react to the person more on the basis of his or her individual characteristics. We like some people and we dislike others—this is natural—but we should not let a person’s skin color, gender, age, religion, sexual orientation, or ethnic background make these determinations for us. And yet, despite our best intentions, we may end up making friends only with people who are similar to us and perhaps even avoiding people whom we see as different. In this chapter, we will study the processes by which we develop, maintain, and make use of our stereotypes and our prejudices. We will consider the negative outcomes of those beliefs on the targets of our perceptions, and we will consider ways that we might be able to change those beliefs, or at least help us stop acting upon them. Let’s begin by considering the cognitive side of our group beliefs—focusing primarily on stereotypes—before turning to the important role of feelings in prejudice. Correll, J., Park, B., Judd, C. M., & Wittenbrink, B. (2007). The influence of stereotypes on decisions to shoot. European Journal of Social Psychology, 37(6), 1102–1117. Correll, J., Park, B., Judd, C. M., Wittenbrink, B., Sadler, M. S., & Keesee, T. (2007). Across the thin blue line: Police officers and racial bias in the decision to shoot. Journal of Personality and Social Psychology, 92(6), 1006–1023. Cunningham, G. B. (2011). The LGBT advantage: Examining the relationship among sexual orientation diversity, diversity strategy, and performance. Sport Management Review, 14(4), 453-461. Fiske, S. T., & Lee, T. L. (2008). Stereotypes and prejudice create workplace discrimination. In A. P. Brief (Ed. ), Diversity at work (pp. 13–52).Jackson, L. M. (2011). The psychology of prejudice: From attitudes to social action. Washington, DC: American Psychological Association. Mannix, E., & Neale, M. A. (2005). What differences make a difference? The promise and reality of diverse teams in organizations. Psychological Science in the Public Interest, 6(2), 31–55. Price, J., & Wolfers, J. (2007). Racial discrimination among NBA referees. NBER Working Paper #13206. Cambridge, MA: National Bureau of Economic Research. Shapiro, J. R., & Neuberg, S. L. (2007). From stereotype threat to stereotype threats: Implications of a multi-threat framework for causes, moderators, mediators, consequences, and interventions. Personality and Social Psychology Review, 11(2), 107–130. doi: 10.1177/1088868306294790. Wood, W., & Eagly, A. H. (2010). Gender. In S. T. Fiske, D. T. Gilbert, & G. Lindzey (Eds. ), Handbook of social psychology (5th ed., Vol. 1, pp. 629–667). Hoboken, NJ: John Wiley & Sons. Zhang, S., Schmader, T., & Forbes, C. (2009). The effects of gender stereotypes on women’s career choice: Opening the glass door. In M. Barreto, M. K. Ryan, & M. T. Schmitt (Eds. 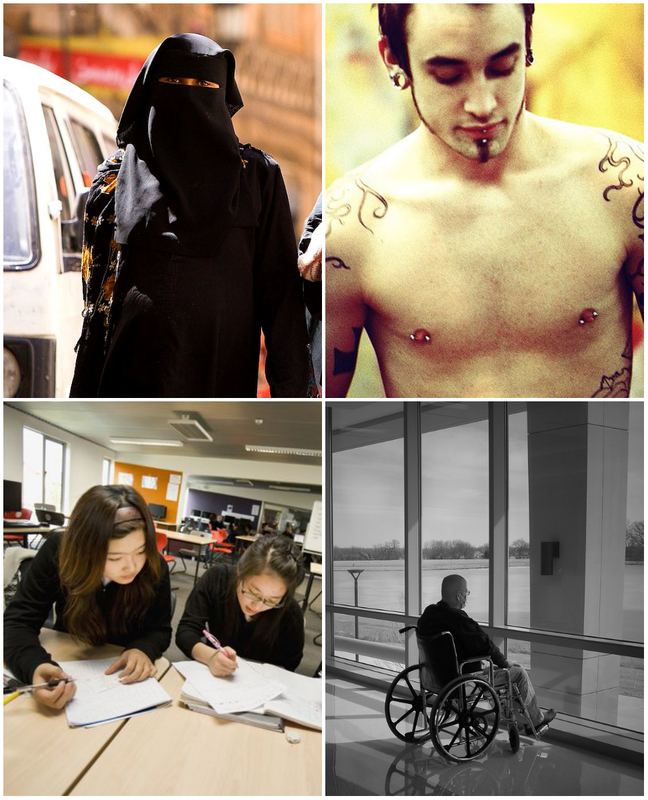 ), The glass ceiling in the 21st century: Understanding barriers to gender equality (pp. 125–150).